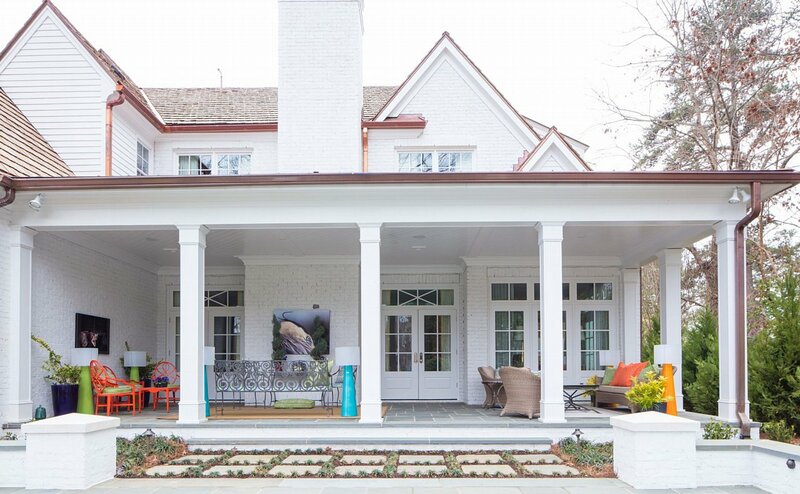 The subdued, white exterior of this Raleigh home shields a surprise – many surprises, in fact. The royal blue front door of the almost 6,000-square-foot house relays a small hint to the interior’s vibrant color scheme. If you like surprises, this house presents one after another. It feels like you could live here a lifetime and never stop being delighted by what’s around the corner. The DJF Builders’ Designer Show House—Raleigh’s largest show house built from the ground up—started as the vision of Dennis Fitzgerald, owner of DJF Builders, and his vice president, Chrissy Gupton. “We started with an idea, a vision of what we wanted this house to be like and who we wanted to benefit from the proceeds of the sale of the home,” Fitzgerald explains. The collaborative effort of a partnership with Allen Tate Realty and Realtor Sheri Hagerty brought results more successful than the group had ever dreamed. All proceeds – more than $400,000 – from the show house, including the sale, profit, and all ticket sales were donated to the designated charity, The Wake County Boys & Girls Clubs. As a custom homebuilder for more than 20 years in the Triangle, DJF Builders is known for building “homes of distinction” and understanding the importance of honoring clients’ investments. Their prestigious and meticulous work on the show house proved no exception. Sally Williams, owner of Colorful Concepts Interior Design, let nature be her guide in the design of the entry hall and master hall. “When designing these spaces, I was inspired by the beauty of nature and the desire to preserve it for the future,” Williams says. Organic elements cavort with colors and finishes offer a gracious, but unpretentious, welc ome. The space doesn’t just look natural. She sourced her floral wallpaper from a supplier that uses an environmentally friendly approach to production. The ceiling showcases a pergola, leafy vines and light streaming down through clouds. In the master hall, Williams also took cues from nature – but she used a different palette here. 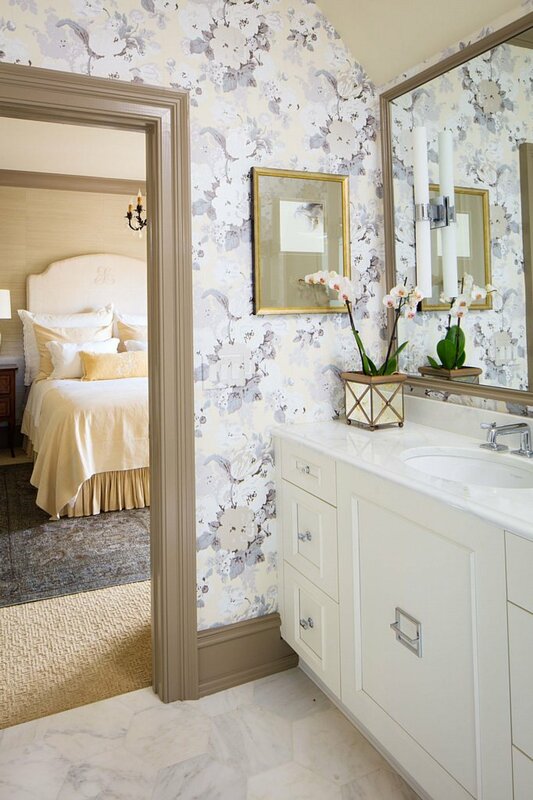 Ombre-style lilac wallpaper goes from light at the ceiling to darker toward the floor. A kaleidoscope of preserved butterflies adorning one wall is a natural wonder and work of art. “Step inside the family room and you are whisked off to the isle of Mustique, the glorious British enclave that mixes a spirited dose of tropic-luxe tempered with continental chic,” Jason Oliver Nixon and John Loecke, the lead designers of Madcap Cottage explain. The family room is chic. It’s whimsical. Tried-and-true black and white provide an anchor for a boisterous, bright yellow-and-pink mashup. The room is decidedly high end with bespoke furniture, textiles, and upholstered pieces from Mitchell Gold + Bob Williams complimented with case goods from Woodbridge Furniture. A colorful fantasia and a feast for the eyes, the family room is made for fun. Emerald green is the backdrop for Katherine Connell’s sophisticated, yet playful, dining room. Connell chose Jane Churchill velvet upholstery for the chairs in a quieter navy and a Manuel Canovas print for drapery panels. Gold accents give the whole room a regal touch – as does the antique dining table and the white lacquered sideboard. 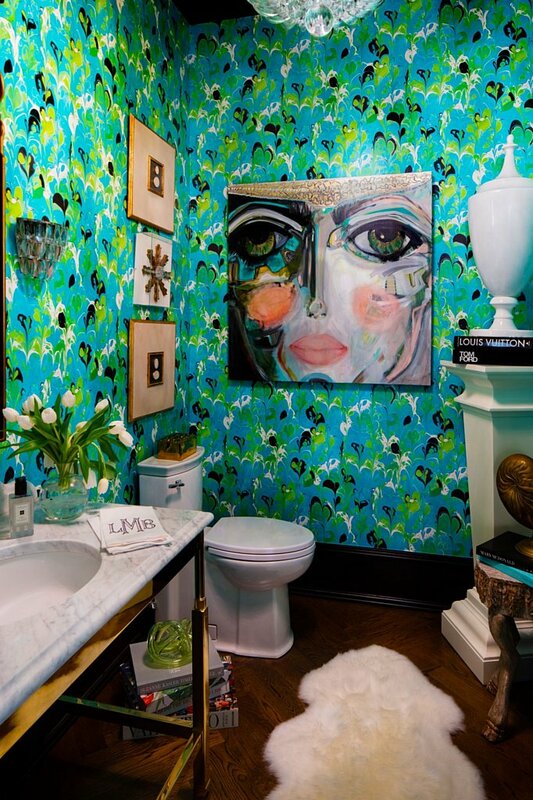 The powder room is a small space that packs a punch. Lisa Mende used artist Jill Seale’s marbled wallpaper in turquoise, lime, and navy as the base for eye-popping art. Seale isn’t the only artist whose work is featured in the room. Raleigh’s Louise Gaskill designed the sconce and pendant. A Windy O’Connor original – a modern take on Queen Charlotte – graces the wall. A distressed, gold-leaf mirror by the famed designer Bunny Williams for Mirror Image Home provides another elegant touch. In the study, MA Allen used a brilliant shade of marigold on the window treatments. Saturated teal pillows that pop off Vintage French 1960s leopard print chairs, high-gloss burgundy walls, and a blend of furniture styles collectively offer clean lines with a modern approach to keep the room rich, yet comfortable. The hideaway offers a nod to tradition with paneled walls, a Chesterfield sofa, and wall-to-wall bookshelves. Chrissy Gupton of DJF Builders used her expertise to design the kitchen – where everyone always gathers – as well as make cabinet, light fixture, and tile selections for the bathrooms and laundry rooms throughout the house. 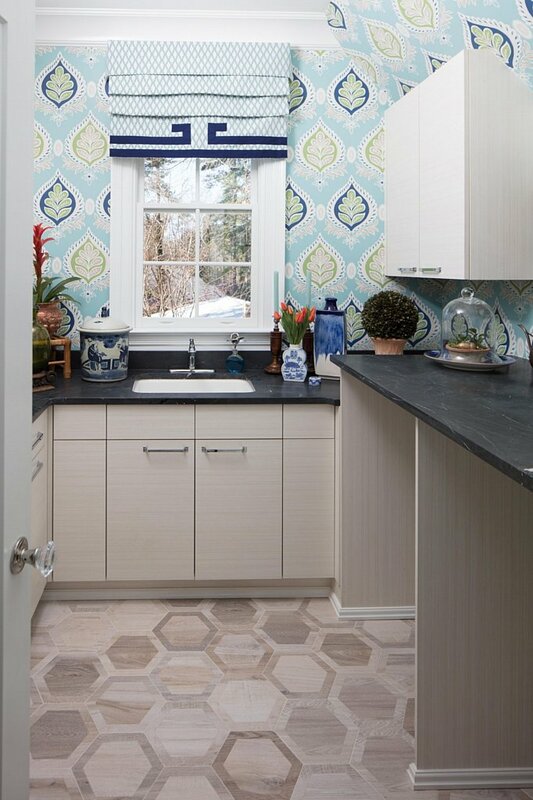 Navy blue – the predominant color in the kitchen – commands attention, yet it’s softened by plenty of white space. Thermador appliances, Calcutta marble, and exquisite accents from Kitchen & Bath Galleries of North Hills are appropriate for the high-end home and ideal for a resident gourmet chef. Open shelving is another aesthetic highlight. Each bathroom has its own personality, yet nearly all make use of luxe marble and gorgeous, high-end tile and fixtures. “My vision was for each of the bathrooms to have a different feel and really show that amazing things can be done even in small spaces using beautiful cabinetry, plumbing, lighting and tile,” Gupton explains. Glamorous is the word for Martha Schneider’s breakfast room. The owner of La Maison used a contemporary aesthetic to make a statement in the room that could easily have gone too casual. The space is practical and comfortable (note the white French farm table), yet up-to-the-minute in its use of a distinctive pink chandelier and acrylic side chairs. The gold console and lamps lend to the glamour of the room while the linen covered host/hostess chairs fulfill the need for comfort. Breakfast has rarely been this sophisticated. This is a room where mimosas are perfectly appropriate. MFANO Designer Inspired Fabrics of Wilmington created the downstairs covered porch as an extension of the home’s living space. Plush, but durable, fabrics work in the space that’s notquite-outdoors. Pattern, texture, and neutrals – punched up by bright colors – are hallmarks of this space that was created for entertainment and relaxation. Randy Trull and John Miller, the two principal designers, focused on a neutral and blue palette with dashes of color. Their Color Path pattern in the bold seating features, along with accent pillows, artwork, and ceramics, round out the living space. The stair hall by Southern Studio Interior Design of Apex takes the kitchen color palette as its inspiration. Even a custom painted wall pendant mimics the kitchen island, providing coherence from one space to the next. Vicky Serany, founder and principal, explains, “Hallways are often used – and frequently overlooked – so we layered the space with a beautiful custom wall finish that introduces texture, shimmer, and unexpected visual interest to create an elegant transitional area that will work hard for the home.” The area is perfectly framed with a stunning staircase compliments of Vision Stairways. Tucked away on the first level of the house is the peaceful master suite done up in serene shades of blue that evoke a field of blue flowers. 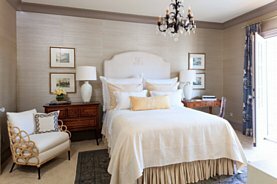 Betsy Anderson Interiors & Co created a space described by the designer duo as romantic, yet practical. A lacquered, fourposter king bed provides the room’s focal point. Period pieces like French bergere chairs, an Asian dresser, an Americana desk, and bench honor the past. A beautiful seagrass rug provides durability and texture. The master bath continues the feeling of serenity with lacquered walls. Marble countertops and mosaic patterned flooring are unmistakably luxe, and the large soaking tub and walk-in shower provide a luxurious personal experience. Bedroom #2 Suite was designed by The Very Thing’s Leigh S. Jones to be a “study in contrasts.” Handloom linen forms a pleasing contrast to the embroidered silk on the bed linens. “Our signature, the Hungarian goose down pillows, was the infrastructure of the bed and the inspiration of the bedroom.” Jones says. Classics such as walnut reproductions of antiques and contemporary touches like rattan lounge chairs with a repeated circular pattern mingle easily, while an antique rug ties it all together. ACR Interiors made Bedroom #3 Suite, a southeast facing room that provides a sunrise view – a “dreamer’s haven.” Designer Alison Roane proves here that fresh and cozy can blend harmoniously with “edgy.” “I intentionally sourced options that were local, sensible, and beautiful,” Roane states. Roane infused the room with seafoam blues and blush pinks and used ecofriendly designers for main furniture pieces. An antique kilim rug helps pull it all together. The Warehouse designers Liles Dunnigan and Zandy Gammons outfitted Bedroom #4 Suite as a comfortable and calm guest retreat. Deep navy walls create a cocoon-like space. A navy-andwhite marbled wall covering on the ceiling highlights a space that’s often overlooked. Clean white bedding creates a peaceful oasis for sleep. Bold colors – in the velvet bed skirt, the navy-and-white bench with Lucite legs and original art by local artists – will make guests feel special. Anne Wagoner Interiors brought sophistication to the garden room. The room manages to be both classic and offer a sense of peace and sanctuary. Painted checkerboard floors, draperies for interior doorways, an elegant chandelier that was custom-made in New Orleans, and geometric and organic shapes make this room a pleasing blend of the unexpected. An element we’re used to seeing outdoors – treillage – is brought inside for a fun and surprising al fresco feel. No pruning required. 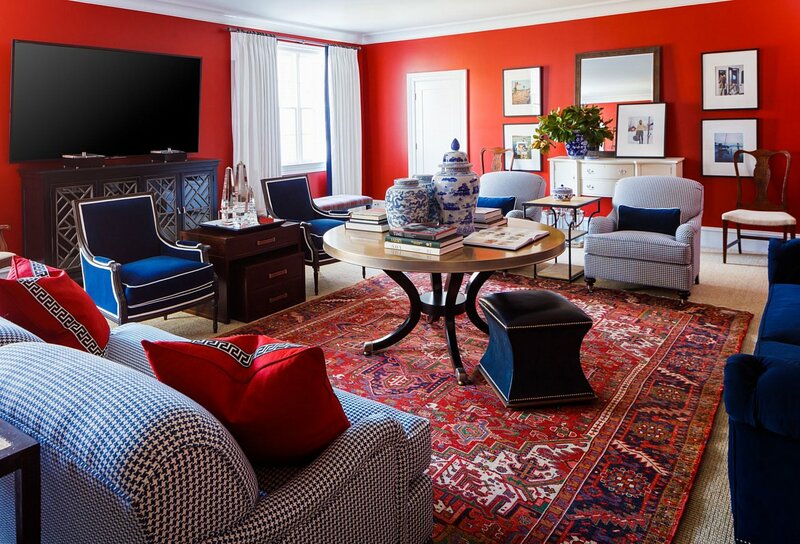 Patrick Casey at Green Front Interiors and Rugs designed the drenched-in-red game room to call to mind an English manor. The room makes the most of its garden views and uses plush navy velvet as upholstery fabric complimented by a houndstooth checker wrapping the seating group – truly a regal touch. A fine Persian wool rug on the floor and Chinese blue-and-white porcelain create a space that’s perfect for a game of bridge, Scrabble, or just gazing out the oyster-linen draped windows. The sitting room was designed as a contemporary, colorful space where the lady of the house can relax (there is a bar cart here, after all) or attend to business. Tula Summerford of Design By Tula mixes antiques with exquisite fabrics, local art, bespoke lighting by Louise Gaskill, and flocked Christian Lacroix wallpaper to form an unexpected, sophisticated, and glamorous retreat. There’s a lot of depth to this room, but you can’t help but notice the one-of-a-kind sconces. They came from a New Orleans estate. Even rooms you wouldn’t expect to exude personality do. 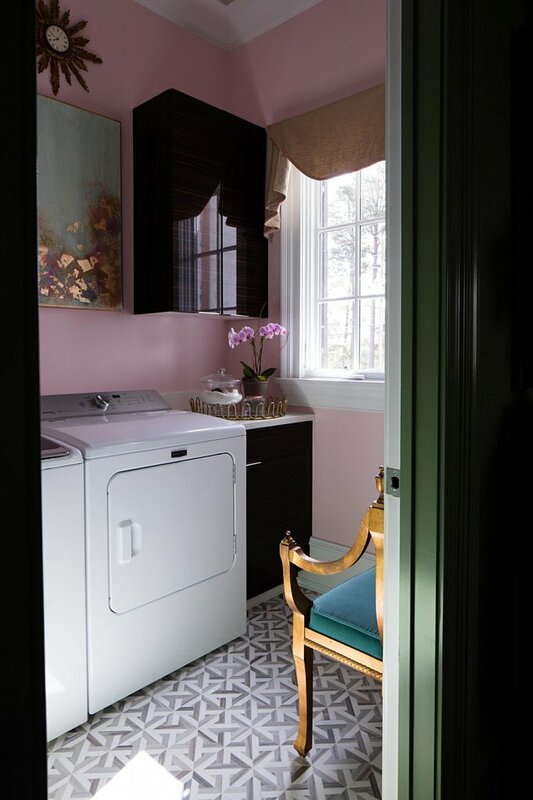 Mary Nell Thompson of The Gilded Acorn prettied up a utilitarian space – the humble laundry room. The main-floor laundry room (yes, this house has two!) makes use of a patterned marble floor. If you’re going to be washing clothes, you may as well be surrounded by beauty. Even original art is not too fine for a space this lovely. There’s a second laundry room upstairs, and it’s graced with driftwood cabinets and faux bois porcelain tile. Blue-and-white porcelain, usually reserved for formal spaces, is an unexpected accent. Mudrooms don’t have to be solely utilitarian, as Danny Taylor of Raleigh’s DT & Co proves. Every corner of a house deserves good design – even a space that serves as a connector from the sunroom to pantry. Taylor achieved impact by starting with apple green walls, trim, and built-ins. That modern color is the unexpected backdrop for traditional furniture and accessories – Audubon prints, Chinoiserie desk accessories, a circa 1780 English chest, a circa 1820 oil portrait of “Man with Spaniel,” a 19th-century English hall chair, and a few, very old Bouillotte lamps. Antique furniture and French hunt scenes are not too fine for this space. “This marvelous chintz combines all my favorite things: dogs, nature, and great vibrant color!” Taylor explains. From the moment you enter the DJF Show House, you’re aware that the home’s classic lines and nods to tradition conceal a happy secret. A traditional home need not be entirely tradition-bound.